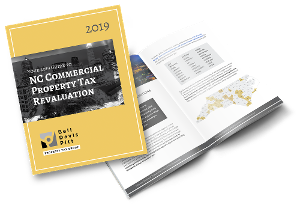 The best time to file an appeal of the assessed value of your NC property is in the revaluation year of the applicable county. That’s because reductions are not retroactive — so a reduction resulting from an appeal filed in the year following the revaluation year has lost one full year of potential tax savings. Essentially, you'll get the most bang for your buck by filing an appeal during a revaluation year. If you have properties in any of the nine 2018 revaluation counties, now is the time to consider an appeal. Having said that, depending on multiple factors, including the tax rate and the length of the revaluation cycle, it might be worth it to appeal even if you missed your revaluation year. In fact, in almost half of North Carolina counties, an appeal filed in 2018 could still provide at least three years of tax savings, and as many as seven. Below is a list of those counties, along with the number of years of potential savings remaining until their next respective revaluation year. If you have property in these counties that you think may be over-assessed, it might be worth it to compute the potential property tax savings remaining on the table. If you have an idea about the true value of your property, an attorney can help you make that computation and decide whether it makes sense to appeal in 2018. When is Appealing your Property Tax Bill Worth the Money?